The painting, Vase of Flowers in a Stone Niche (1615), was destined to be on display at Tefaf in Maastricht. Mauritshuis knew that it had to act quickly, as it expected fierce competition for the work at the prestigious art fair, and managed to conclude the sale prior to the opening of Tefaf. The new acquisition was exhibited at Tefaf for the opening day today, and will remain on view for visitors for the duration of the fair. The genre of floral still-lifes is especially well represented in the collection of the Mauritshuis. It is one of the few museums in the world that can exhibit a representative overview of the evolution of this genre from the 16th-century (Ludger tom Ring) through to the 18th-century (Jan van Huysum). The museum already owned excellent examples by two of the three pioneers of the independent floral still-life genre: Ambrosius Bosschaert and Jacob de Gheyn. 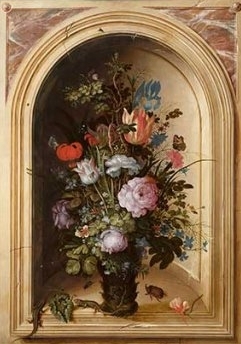 The acquisition of Vase of Flowers in a Stone Niche by Roelant Savery completes the ‘bouquet’. Vase of Flowers in a Stone Niche was one of Savery’s most ambitious floral still-lifes, not only because of its relatively large dimensions (it was the second largest floral piece that he painted), but also because of the meticulous way in which all the details are depicted. The glass containing the flowers protrudes slightly over the edge and casts a delicate shadow onto the lavishly rendered stone surround. The signature of the artist and the year 1615 seem to be chiselled onto the stone below the vase, on the left hand side. Small, painted cracks in the stone surround enhance the trompe l’oeil effect of the piece. As was typical in early 17th-century floral still-lifes, the painting shows something which doesn’t exist in reality: flowers that actually bloom at different times of the year. In this sense, the painting surpasses nature. Amidst the colourful bounty of the flowers, thorn bushes strikingly occupy the centre of the painting. These thorns evoke a rather ominous atmosphere, perhaps as a warning not to be misled by the alluring beauty of the flowers in bloom. Savery had a penchant for representing untamed and often foreboding nature. His predilection is also apparent in this floral piece. It is a world in which beautiful flowers bedazzle, but where danger lurks at every corner: the razor-sharp thorns between the flowers, the lizards pursuing a dragonfly and the Mandingos large beetles creeping around the vase. Roelant Savery was an exceptionally gifted painter from the Southern Netherlands. His specialties were forest and mountain landscapes, animal pieces, and floral still-lifes. He imbued all the details of plants, trees, flowers and animals in his paintings with a meticulous and life-like quality. His ‘true to life’ sketches of nature are also well-known, as well as his drawings of peasants and other subjects relating to rural life. In his own lifetime Savery’s paintings were extremely valuable and popular in Court circles. Roelant Savery was trained as a painter in the Amsterdam studio of his brother Jacques, and remained and worked there for many years after his training. Shortly after 1600, both brothers were among the first Dutch artists to paint independent floral still-lifes. Their collaboration ended in 1603 with the death of Jacques following a plague epidemic. Roelant’s career then took a new turn, as he left for Prague to work in the service of the art-loving Habsburg Emperor Rudolf II. A few years after Rudolf’s death he returned to the Netherlands and settled in Utrecht where he remained for the rest of his successful career.